The Catholic Church is a hierarchical Church in which the Pope and the bishops in communion him have the right and the duty to teach, sanctify, and govern. 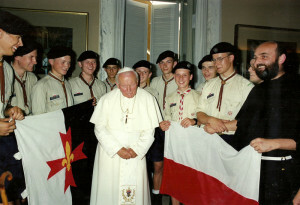 One would think, therefore, that the fact that there is no condemnation of Baden-Powell’s educational method (in fact, as we’ll see below, not only is there no condemnation of it but rather the opposite) is sufficient to show that scouting is not un-Catholic; for if it were un-Catholic, then the Pope and the bishops in communion with him have failed in their duty to teach, sanctify, and govern for over 100 years. The scouting movement, in all its flavors, is not insignificant — there are somewhere between 25 and 40 million scouts and guides throughout the world today, about 8 million of whom are Catholic (and it must be added that the ICCS’s number includes only those who belong to mainstream, WOSM/WAGGGS scouting and guiding associations). I don’t believe it is possible, on the one hand, to be Catholic and believe what Catholics believe about the authority of the Pope and the bishops in communion with him while, on the other hand, holding that scouting is un-Catholic. It would be akin to saying that football (whatever variety) is un-Catholic. It is true that in the early years of scouting, there were Churchmen in continental Europe who were suspicious of the new movement. There were two articles published in the French Jesuits’ journal Études that were critical of the new movement; and in 1913 Jacques Sevin, S.J. (then a Jesuit scholastic) was asked by his superiors to look into the scouting movement (with happy results). It is also true that the Italian Catholic scouting association ASCI (founded by Count Mario di Carpegna, a member of the Pope’s Noble Guard) was suppressed by Pope Pius XI in 1927 (according to one source, 1928), but that decision was a political one — to ensure the survival of Catholic Action under the Fascist government — rather than moral or doctrinal. The suppression was lifted in 1944 when the Fascists fell out of power. 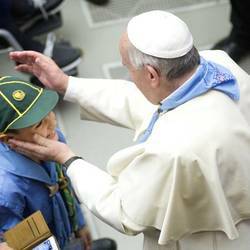 We know the Pope’s decision was political because he had spoken in favor of the scouting movement in 1923 and had received an international pilgrimage of scouts in audience in 1925. You are not only scouts that are Catholic, but Catholic scouts, that is to say, Catholics that bring from the daily practice of their duty to God, and their neighbor, an energy and generosity that is taken to the commitments made, and to the training received as scouts. So the only evidence that one might marshal in favor of scouting’s being un-Catholic is that (a) near the turn of the 20th century, some French-speaking clergy disapproved, and (b) that one Catholic scouting association was suppressed by the Pope under pressure from an unfriendly government. Not exactly the sort of evidence that would hold up long under cross-examination! The Scouts of France were started in 1920 by Fr. 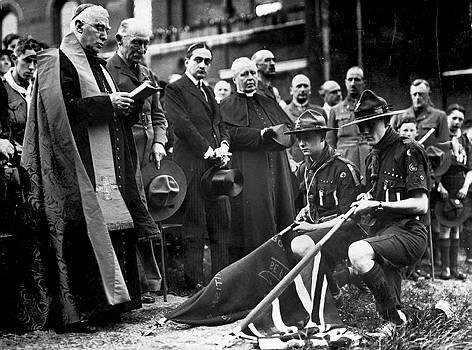 Jacques Sevin with ecclesiastical approval, and even if one could argue that Pius XI suppressed the ASCI due to cause, he did not suppress any other Catholic scouting associations such as the Scouts of France or the Baden-Powell Belgian Boy Scouts (founded by Jean Corbisier in 1912). Therefore, the worst one could say is that scouting is a morally neutral public activity like football, and perhaps the exigencies of the age require that Catholics participate in public activities that are morally good to the exclusion of those that are morally neutral. This, however, is not tenable any more than the blanket negative statement on scouting. 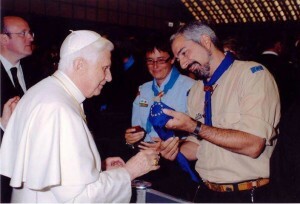 Every Pope since Pius XI (with the exception of John Paul I) has commented favorably on the scouting and guiding movement. The words of Pope St. John Paul II and his successor Benedict XVI are particularly pertinent. The meeting of the scout method with the insights of Fr Sevin, S.J., has made it possible to develop an educational program based on Gospel values, in which each young person is led to grow and to develop his personality, thus making his talents fruitful. The scout law, training young people in the way of virtue, invites them to moral rectitude and a spirit of asceticism, thus directing them to God and calling them to serve their brethren; by striving to do good, they become men and women who can play a responsible role in the Church and in society. In a troop, at camp, and in other situations, Scouts discover the Lord through the wonders of creation, which they are called to respect. They also have a valuable experience of ecclesial life, meeting Christ in personal prayer, to which they can become accustomed, and in the Eucharistic celebration. In addition, Scout unity gives young people the opportunity of an apprenticeship for life in society with mutual respect. For a century, through games, action, adventure, contact with nature, a team spirit, and service to others, an integral formation of the human person is offered to everyone who becomes a scout. It would be appropriate to recall the words of Fr. 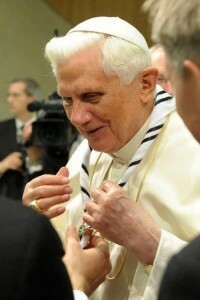 Jacques Sevin, S.J., the founder of Catholic Scouts: “Holiness does not belong to any specific period and has no specific uniform.” The sense of responsibility inspired by the scouting pedagogy leads to a life in charity and the desire to serve one’s neighbor in the image of Christ the servant, relying on the grace that he bestows especially in the Sacraments of the Eucharist and Reconciliation. If we accept the Lord’s invitation to go towards him and to experience his love that fulfills our hearts with joy, then he will take off any fear: fear of God, fear of the other, fear of facing the challenges of life. And he will send us to announce his love to the ends of the earth, and serve our neighbor in the most remote peripheries. But this is possible only if we cultivate our friendship with Jesus, trying to meet him more, especially in his Word and in Sacraments. The Sacraments of Baptism, Confirmation and Eucharist form a unique saving event in which we are configured to Jesus Christ dead and arisen, becoming new creatures, members of the Church. How many generations owe to the scout method their growth on the way of holiness, the practice of virtues and in particular greatness of soul! Given what has been related above, what possible reason could a Catholic have to claim that scouting is un-Catholic? Even if one believes, as some do today, that recent Popes have sometimes faltered in their teaching office, or been less than completely clear in their exercise of that office, what of the approval of Pius XI and Pius XII? I don’t think this can be so lightly set aside. In truth, to claim that “scouting is un-Catholic” is to reject the authority of the Church — fine if one belongs to another religious confession, not at all fine if one is Catholic and wishes to present oneself as a loyal son or daughter of the Church. It is true that scouting is not for everyone. Many things which are nevertheless good are not for everyone. For example, the consecrated religious life is not for everyone, yet it is certainly good. I realize that one can’t really compare scouting to the religious life — religious life is certainly necessary for the Church, while scouting isn’t; religious life is mentioned in Holy Scripture, while scouting isn’t; etc. But while all things that are necessary are good, not all things that are good are necessary. Our FNE Explorers group, North Star FNE, recently had its first winter camp. (You can read about it here, or at least see a bunch of pictures.) Since I was responsible for planning the weekend’s Timber Wolf program, I would like to offer a few personal reflections. Everything came together nicely, and I can say without false humility that that would not have been the case if it weren’t for my brother leaders. Planning food, activities, and two nights’ campfires is probably too much for any one person. Thankfully, we each have our strengths and weaknesses; some people are better at putting together a campfire program, while others are better at shopping for and cooking food for 25 (it’s only when our youth reach the Explorer level and are working as a patrol that we expect them to shop and cook for themselves, though we do like to introduce our Timber Wolves to some of the basics of campfire cooking, setting up a camp kitchen, etc.). Since I was in charge of the Timber Wolf program, I did not make it over to the Explorer camp to see how they were doing, but they seemed to deal with the cold pretty well and overcome a lot of the hardships associated with camping in such weather (such as needing three hours to cook breakfast outside on Saturday morning). Camping over Super Bowl weekend is a good way to ensure that you have a park almost entirely to yourself. Last, this list would not be complete without a shout out to our brothers in West Virginia, Our Lady of the Annunciation FNE, who traveled four hours each way in the bitter cold (with snow threatening on the ride home) to share camp with us. I have been reading a couple of articles on this subject recently. The first, by Brenton Dickieson, argues that “the best way to read Narnia is to re-read Narnia.” It’s hard to argue with that (and though I’ve taken a quote from the last paragraph in order to summarize the article, the whole thing is well worth reading). But he also argues that the “Published Order” is best when reading the Chronicles for the first time. The second article, by Stephen Greydanus, argues that the Published Order is the only way to read Narnia, and goes so far as to say that the “Chronological Order” promoted by the publishers is a “travesty.” But I think Greydanus, too, is thinking mainly of first-time readers. Perhaps an unsuspecting parent will pick up The Magician’s Nephew and give it to his children, or even read it aloud to them! I’m not sure I would call that a “travesty” but it would certainly destroy the sense of wonder that one has upon reading The Lion, the Witch, and the Wardrobe for the first time, and discovering the world of Narnia along with the Pevensie children. Unfortunately, The Lion, the Witch, and the Wardrobe was not my own introduction to the world of Narnia, but neither was The Magician’s Nephew (I had an unusual teacher for fourth grade, and we read The Voyage of the Dawn Treader in class – as well as The Hobbit), so I remember how odd Professor Kirke sounded when he counselled the older Pevensies, even though I only understood his words much later in life. And I do, of course, remember my older children’s wide eyes upon reading Lion to them. That said, although I prefer the Published Order to the Chronological, I don’t quite agree with Greydanus’ assertion that “there is a natural break between the first four stories and the last three stories.” One could just as well argue that there is a natural progression between The Lion, the Witch, and the Wardrobe and The Last Battle, with The Horse and His Boy and The Magician’s Nephew as standalone stories. The Silver Chair isn’t the last of Eustace Scrubb’s adventures in Narnia, and it is also a “break” from the first three (published) books in that the Pevensie children aren’t in it. The Lion, the Witch, and the Wardrobe should be read first. This is non-negotiable. Prince Caspian, The Voyage of the Dawn Treader, The Silver Chair, and The Last Battle should be read in order. The Horse and His Boy and The Magician’s Nephew can be read at any point after The Lion, the Witch, and the Wardrobe and before The Last Battle. All the above is, of course, just my opinion, and Your Mileage May Vary. But I hope it will be helpful if you’re a first-time reader of the “Chronicles” or thinking of introducing your children to them.